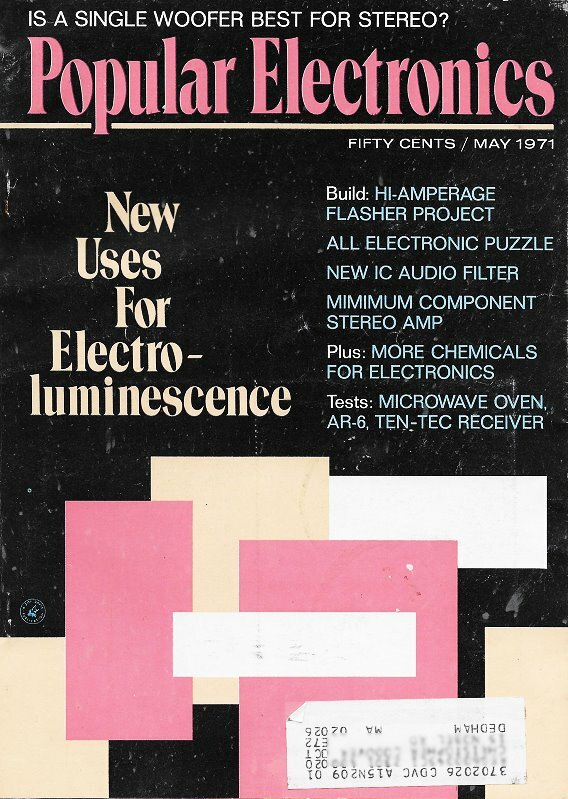 Following the previous month's introduction to "Chemicals for Electronics," which covered degreasers, cleaners, and polishing agents, author Lon Cantor in the May issue of Popular Electronics wraps up with coolers, lubricants, and special agents (no, not spies) such as protective and insulating coatings. He devotes a lot of space to freeze spray for use in troubleshooting problems caused by overheating circuit components. In the days before comprehensive computer aided design environments that can identify heat concentrations with detailed temperature maps and design rules checks (DRC), predicting potential overheating sources in both normal operation and during impending failure was much more difficult. Running a large series of worst case scenarios on actual hardware and monitoring multiple areas of circuitry was too time consuming and expensive to do for non-critical applications (as opposed to things like life support and space operations). My point is that the likelihood of overheating-induced failures is less likely with today's products when proper design and operation is conducted. 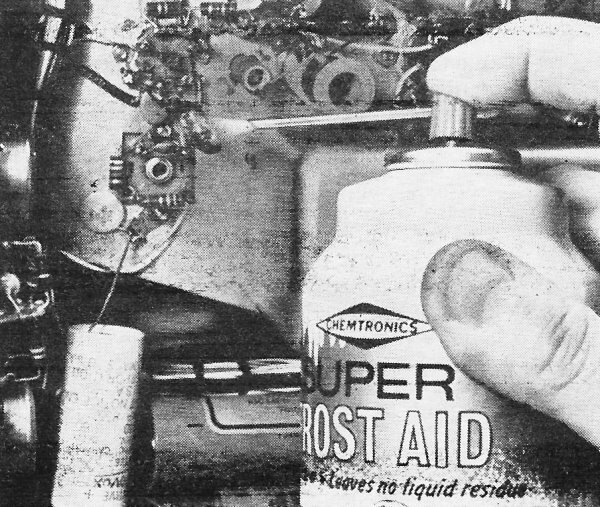 Freeze spray was an indispensable resource for both troubleshooting and design prototyping before such computer methods were available. Last month on these pages we expressed some surprise that so few electronics experimenters make use of the many chemical aids available to them from jobbers and distributors. This is particularly true if the experimenter has encountered the so-called "tough dog." Technically, the TD is an intermittent - a circuit defect that can drive hobbyists wild with frustration. Intermittents pop up when your equipment works well for 10 or 15 minutes, then loses power, generates distortion, becomes erratic, or quits altogether. The problem is that as you try to track down the trouble, it moves off in another direction. Fortunately, most TD's are related to heat and can be tamed by using a simple chemical tool - an aerosol can of component cooler. Thermal Intermittents. There are two basic types of thermal intermittents: (1) components that work properly only when they are hot, and (2) components that work properly only when they are cool. Some resistors, for example, start off in fine shape when they are cool, but rapidly change in value when heated up. If you check circuit voltages when the equipment is hot, you may obtain all sorts of "wrong" voltage readings. When the equipment is turned off and the resistors are checked with an ohmmeter, all the readings are good - since in most instances the resistor has cooled down enough to look normal. In some instances, solid-state devices will have internal metallic contacts that tend to open when the ambient temperature rises. On the other hand, some components have hairline cracks or contacts that do just the opposite: open up when the component is cool. The latter sort of intermittent (enclosing the crack or contact after the equipment has been turned on) is probably one of the most frustrating problems. One of the "strangest" chemicals that the hobbyist/experimenter may want to try is Cool-It-Gel sold by Dynatek lndustries, Box 24268, Cleveland, OH 44124. This jelly-like substance is a pale blue viscous mix that is brushed, dipped or fashioned like putty to make a heat sink! 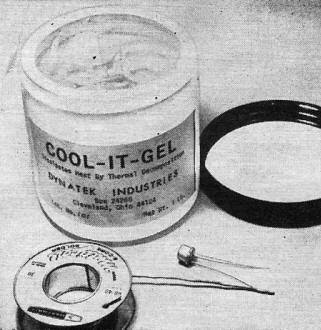 If, for example, some of the Cool-It-Gel is "puttied" around transistor leads ready for soldering, the Gel will protect the transistor by dissipating the heat. The Gel itself gradually disappears and will not run, drip, prove to be toxic, create fumes, etc. The manufacturer recommends Cool-It-Gel for electricians and welders working in tight quarters or with delicate components. A trial pint is $2.95, postpaid. A. Based on the symptoms and your understanding of how the equipment works, use flow logic to isolate the trouble to one or two stages. B. If the equipment is vacuum-tube operated, replace all the tubes in the suspected stages. Don't test the tubes because intermittents are seldom detectable on a tube tester. C. Apply power to the equipment and heat it up as rapidly as possible. Some technicians cover equipment with a cardboard box to speed heating in the absence of ventilation. Let the equipment operate until the trouble either appears or disappears and at this point you have a chance of proceeding with your troubleshooting. Use a chilling spray with an extension tube to spray each resistor, capacitor, and semiconductor individually. Keep the spray away from vacuum tubes - a cold spray can easily crack the glass envelope. When you note a dramatic difference in circuit performance, you'll know you have spotted the culprit. Spraying the faulty component with the cooler should turn the trouble on or off like flipping a switch. Replace the faulty component and "cook" the equipment for at least an hour. Respray the new component to make sure that you have really located the trouble. 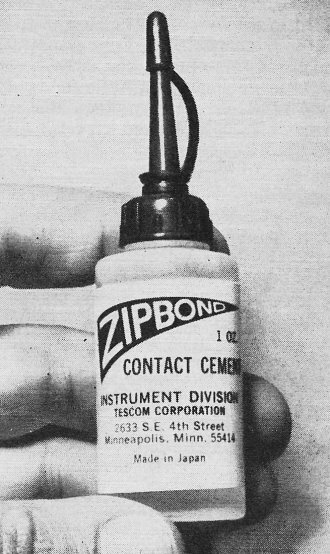 Zipbond Contact Cement distributed by Tescom Corp., Instrument Division, 2633 S.E. 4th St., Minneapolis, MN 55414 is one of the most unusual chemicals available to the advanced hobbyist and experimenter. It may be used to bond a wide range of materials - metals, plastics, glass, rubber and hard woods. There is no mixing or heat treating - simply apply a drop of liquid for each square inch of surface to be bonded. Apply light pressure for about a minute and a bond of very high shear strength is made. Zipbond is expensive ($15.95/oz), requires careful use, and should be refrigerated when being stored. Other Component Cooler Uses. Aside from locating thermal intermittents, component coolers arc excellent for finding hairline cracks on printed circuit boards. Cracks are a real nuisance, since you can't see them with the naked eye unless you know precisely where to look. A good component cooler will help you spot the trouble fast. Simply spray the cooler (without the extension tube) over the suspected circuit board. The areas covered by printed conductors will frost up, turning white. The areas without the etched conductors won't change color. Any crack in a conductor will look like a thin, dark line and should - stand out prominently. Aerosol freezing sprays make an excellent soldering aid. They can be used to protect delicate components such as transistors, diodes, and integrated circuits which might be damaged by the heat of soldering. Spray the component, chilling it thoroughly and you won't have to worry about using a heat sink. Many experimenters also use component coolers to prevent cold soldered joints. Once the solder is flowing freely and the connection has been made, they give the new joint a quick blast of the chilling cooler. This blast quickly absorbs the heat from the solder and eliminates the possibility that something might move before the solder has set. Also, the cooler washes away excess rosin and residue, leaving a clean, bright, soldered joint. Certainly this method is far preferable to the practice in many laboratories of cooling the solder joint with a little spit at the end of your finger. A freezing spray can also be used to rescue a power transformer. Experimenters sometimes fire up circuits only to see the power transformer start to smoke. When this happens, pull the plug fast and reach for your aerosol cooler. If you chill the transformer fast enough, you will keep the wax, varnish and shellac from running and causing internal shorts in the transformer windings. Choosing a Component Cooler. With all the component coolers on the market, how do you choose the right one? 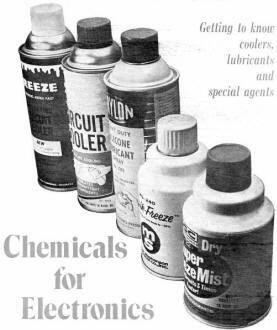 The best coolers are made with blends of Freon. As mentioned in the first part of the story, Freon is Dupont's trademark for trichlorotrifluoroethane. This product is used both as an aerosol propellant and as a cleaning agent. Special blends of Freon are excellent as coolers working on much the same principle as a refrigerator - a liquid changed to a gas absorbing a tremendous amount of heat. A good component cooler can drop the temperature of a small component to minus 50 degrees Fahrenheit in a matter of seconds. Some manufacturers of component coolers for the sake of economy will add vinyl chloride to their product. Vinyl chloride is cheaper, but does not cool as well as Freon and, what's worse, tends to run (cooling unwanted components). It also has the undesirable after-effect of leaving a residue. You can usually detect the presence of vinyl chloride in a circuit cooler with your nose - it smells sharply of chlorine. Oddly enough, packaging makes a difference in component coolers. Freon products are packed, under high pressure and must be in a seamless can. Aerosol cans with seams simply can't hold this amount of pressure and for safety, the law requires the use of seamless cans for all high pressure applications. Coolers packed in seamed cans or using vinyl chloride do cost less, but in most cases, this is considered to be a false economy. For one thing, inadequate cooling can cause you to skip right over a defective component and the better products can chill more components per ounce of cooling fluid. Loss of gain and erratic operation reo suited from manufacturing defect in bypass capacitor. Tipoff was gradual loss of signal after receiver had been in operation for an hour. Cooling down suspect components with freezing spray quickly pin-pointed defective capacitor. Lubricants. The experimenter with a home workshop has an incredible variety of lubricants available to him from electronics parts distributors and hardware stores. The most common lubricant are of the type known as all-purpose, penetrating and lubricating oils. Made from petroleum bases, these lubricants are excellent for freeing rusted parts, as well as reducing friction in motor bearings, couplings, etc. Most of these lubricants tend to retard rust and many are available not only in drop cans, but as aerosols. Some of the more unusual lubricants that should be investigated by the experimenter include white grease, dry graphite and silicones. White grease is excellent for small motors, gears and bearings and is available in small squeeze tubes. Graphite has been used in a powder form for locks and is now available in aerosol cans. Silicone lubricants are very slippery, wear well, and usually seal out moisture. These lubricants are also available in aerosol cans and function very well over a wide range of operating temperatures. A Teflon dry lubricant is now available in an aerosol can and, is used where very high operating temperatures are encountered. Cryogenically processed Teflon is also used, although it is not commonly available to most experimenters. Insulating and Protective Coatings. No electronics experimental laboratory workbench is complete without a bottle of brush-on insulating coating (or varnish) and an aerosol can of acrylic protective spray. Brush-on insulating coatings are particularly useful around high-voltage circuits where they can be used to stop arcing and corona. These coatings can also be used for "potting" components, holding high voltage leads in place, insulating PC boards, and making temporary repairs to exposed wiring. Acrylic insulating and protective sprays may also be used to coat low voltage exposed wiring, waterproof spark plug cabling in ignition systems, inhibit rust and corrosion on exposed surfaces, act as a protective coating for outdoor antennas (especially in areas where there is salt spray or industrial smog), and/or retard fungus and mildew. Although most of the crystal-clear acrylic sprays are available in aerosol cans, you can also buy a viscous acrylic liquid in a bottle and apply it with a brush. In many instances, the latter method is to be preferred - especially when working in tight corners.